CLEARFIELD – Lawrence Township police are seeking the public’s assistance in locating a local Grinch who stole Christmas. Police have received a report about an alleged theft in the area of Route 322 along the railroad bridge that runs parallel to the roadway. 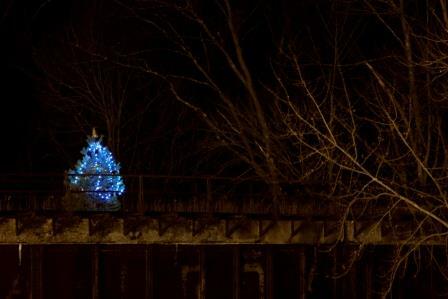 Police say unknown suspect(s) “stole the spirit of Christmas” by cutting cords and taking decorations, solar lights, bulbs, garland and a tree topper from a Christmas tree on the bridge. Arnold Swales of Clearfield decorates the tree to spread Christmas joy. He discovered it was damaged and its decorations were stolen Monday morning. Anyone with information about the incident is asked to contact the Lawrence Township police at 814-765-1648/47.